In evaluating timber markets and wood baskets for forest industry and bioenergy investments, a key concern is the “riskiness”, health and competitiveness of wood-using manufacturing facilities in and near the market. Timberland investors want to confirm that the mills will remain open for years to come to buy their trees and logs. Existing wood-using mills have interest in the health of their competitors for wood raw materials. And new wood-using plants – such as bioenergy projects – want a sense for the potential that existing wood-users may have outlived their usefulness and may slow down or shutter, thereby alleviating competition for desired raw materials. End markets. Are the end markets – such as newsprint versus fluff pulp versus linerboard – served by the mill strong or weak? The answer to this question is observable and can be answered with readily available data. It provides a powerful, first-cut at the situation for mills in the market. Firm commitment. Ultimately, are the corporate parent and owners demonstrating high or low commitment to the continued operations of the mill? We maintain a checklist of items that, for the most part, are answerable with publicly-available information. Questions on this list include, for example, employment levels and hiring activity, signs of community involvement, and capital allocation as disclosed in press releases or public filings. Facility health. Is this facility, in its structure and equipment, old or new? Does it employ cutting edge technology? What is the “ability to pay” for raw material? How efficient is the plant relative to others in its industry and market? While this is the most difficult of the three categories to assess, strong conclusions on “end markets” and “firm commitment” usually correspond with conclusions associated with facility health. In this way, each of the categories serves, at some level, as a proxy for the others. Forisk will discuss risk analysis of wood-using mills during “Timber Market Analysis” on August 12th in Atlanta, a one-day course for anyone who wants a step-by-step process to understand, track, and analyze the price, demand, supply, and competitive dynamics of timber markets and wood baskets. For more information, click here. This is the second in a two-part series related to wood supply agreements and their relevance to analyzing timber markets. As a general rule, we find it helpful to avoid swimming in the toilet or peeing in the pool. Clear, verifiable methodologies for collecting data and reporting changes over time facilitate strong wood supply relationships. In specifying these methods, parties in a long-term wood supply agreement may rely on a set of working principles. Reflects market prices: The log or wood transfer price should approximate an “arms-length”, market based price. While the transfer price may deviate from the market price for a given month, the prices paid by the mill or bioenergy plant for raw matieral over time should minimize the perceived and actual missed opportunities of bypassing other customers and markets. This criterion passes the fairness test and retains the benefits of operating in a market environment. Easy to implement and to use: The model should be easy to understand, easy to explain, and easy to use. Complex transfer pricing methods do not create value for business owners; simple transfer pricing models allow managers to focus time and resources on operating the business. Retains flexibility: At times, the two parties may feel the transfer price requires an adjustment. Rather than disregard the model to make an adjustment, an approach should be determined in advance for adjusting the model or revising the price. As such, the option would exist for both parties to agree to periodically review and revise, if necessary, the transfer price based on new information or on a region-wide log price index. Situations exist when both parties want to revisit prices and how they were calculated, and accounting for this in advance based on clear principles can minimize unnecessary costs, friction and arbitration. For investors and analysts evaluating wood and timber markets, Forisk offers “Timber Market Analysis” on August 12th in Atlanta, a one-day course for anyone who wants a step-by-step process to understand, track, and analyze the price, demand, supply, and competitive dynamics of timber markets and wood baskets. For more information, click here. This is the first in a two-part series related to wood supply agreements and their relevance to analyzing timber markets. In his 1989 book Liar’s Poker, Michael Lewis wrote, “Risk, I learned, was a commodity. Risk could be canned and sold like tomatoes.” This represented a prevailing view among the sophisticates of Wall Street prior to the mortgage bubble and collapse of AIG. 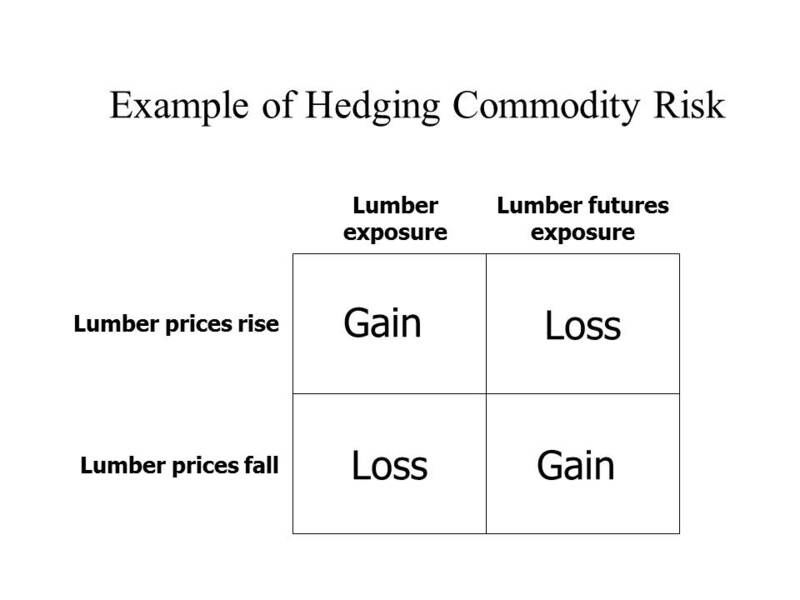 Though the view of risk “as a commodity” varies over time, it remains critically important to managers and investors exposed to timberlands and wood-using assets. One tool employed to mitigate risk in timber-related industries is a wood supply agreement. Forest industry managers and bioenergy project developers sometimes use wood supply agreements to manage the costs and flows of logs and other woody raw materials to manufacturing facilities and bioenergy plants. Integrated forest products firms also used them to work through the operational impacts of timberland divestitures. A typical agreement comprises a contractual obligation by a supplier to provide agreed-to volumes of wood to a buyer, who commits to purchase this raw material at the contract price. Most agreements reflect a tradeoff between security and flexibility. In guaranteeing volumes, the supply agreement secures supply for the mill and a market for the timberland manager. The aspects subject to negotiation include product, volume, timing, and price. Product specifies the species and “specs” of the product to be delivered. Pine pulpwood or hardwood logs? Volume specifies the amount of wood covered under the agreement, whether it is fixed or a range. Timing specifies the timeframe covered, and the time periods for actually delivering the wood. Price specifies the method and manner for pricing the wood delivered, and the process of updating and communicating this price. The “pricing mechanisms” built into wood supply agreements are of central importance. They have influenced many a bonus, ulcer and sleepless night. How can fair prices be calculated over time that account for actual market activity while minimizing the “penalties” for being locked into a set marketing arrangement? Existing supply agreements attempt to balance two competing aspects of pricing wood based on available data. The first asks the question, “How does the market price this wood?” The second asks, “What is the value of this wood in the market?” The first is the question of the wood buyer, and the second is the question of the stumpage seller. Common approaches include rolling averages, indexing, and blended indexing. Rolling (moving) averages are used within the forest products industry, and in other heavy industry settings, to calculate transfer prices and for raw material supply agreements. One advantage of a moving average is that it reduces the peaks and valleys associated with changes in log prices. One disadvantage is that, for any given month, the transfer price lags the actual market price, though this should balance over time. Recent issues related to supply agreements have focused on reduced confidence in the data underlying a supply agreement and concerns about conflicts of interest associated with pricing mechanisms or indices provided by the same firm that collects and reports the underlying price data. These issues become relevant when conducting due diligence on timber markets or wood baskets as they can affect the ranking and risk assessments associated with potential or existing wood procurement strategies. News flash: we all make errors when analyzing forestry investments. Which are the most common and how can we avoid them? At the end of the day, most analytic errors in forestry relate to the data used – the inputs – or the math in a spreadsheet. Errors associated with inputs affect the cash flows in the analysis and how it impacts value when discounted back to the present. When reviewing models for clients, we commonly find errors associated with the assumed costs, the estimated revenues, the timing of cash flows and the expectations associated with inflation and asset appreciation. Specifically, in our work and the work of others, we focus on and observe three major categories of errors in Excel models and spreadsheets. Second, we observe application errors, which basically reference issues with the thinking behind the spreadsheet, the formula chosen, the use of a formula, or a comparison made. For example, analysts commonly make mistakes with inflation by mixing real and nominal discount rates and cash flows. Also, spreadsheet models of forestry investments may inappropriately compare before and after-tax results and investments of differing duration (time periods). Finally, using the incorrect metric can be problematic, such as misapplying cash-on-cash return, pay back analysis and internal rate of return (IRR). We typically find errors of this type when analysts are comparing timberland and forestry investments with alternative asset classes, such as stocks, bonds, agricultural commodities and commercial real estate. Historically, the day-to-day metrics for forestry differed in application, so a bit of time spent checking assumptions and thinking through the communication of results can be helpful. Third, errors of omission are especially problematic (and embarrassing). We work hard to avoid the situation of being asked “did you check _____?” and, if relevant, having to answer “No, we didn’t think of that.” Ugh. Unfortunately, we find that third-party spreadsheets often omit key facts or considerations, including relevant costs and potential revenues. Just as important can be confirming that the assumed costs and revenues are current and reflect the best available, accessible information. In short, know what’s knowable. We observe a few key practices in our work with clients to minimize the chance and occurrence of errors. First, we label tabs and worksheets, and date all files. That way, if we revisit a model several weeks or months later, we can retrace our steps and know what we’re working with. Also, if we correct an error or make another improvement, we know which version is the most current. Second, we try to set aside time to check each other’s work before sending results “out the door.” Admittedly, this is also the most challenging. We find that imposing and embracing milestones – midpoints for deliverables or reviewing work – throughout a project institutionalize a level of quality control. Finally, at the end of the day, we ask ourselves the question “where could we have blown this?” Some level of paranoia and self-awareness is required for quality analysis of forestry, or any other, investments. Click here to register for “Applied Forest Finance” on February 7th in Atlanta. The course details skills and common errors associated with the financial and risk analysis of timberland and other forestry-related investments. You are an Analyst, a warrior shrouded in mystery and feared for your ruthlessness with Excel. Your actions can throw Investment Committee meetings into chaos, and your existence will shape forest management during this pivotal moment in history. Investment objectives matter. Analysts use finance to compare projects and identify those that satisfy the predetermined criteria of clients or managers. This facilitates the investment decision by screening out those that we can set aside, and those that we should consider further. For example, a preliminary screen may include geography, deal size, information quality, and basic financial metrics. If the potential investment satisfies the initial screen, then managers can allocate the human and financial resources required to investigate further. Analyze and value timber and timberland investments and alternatives. As analysts and researchers, how can we better support our firms and clients? Over time, I have found few methods as effective for increasing analytic rigor and reducing errors as repeated application of financial tools in a range of forestry-related cases to highlight the range of unique questions and attributes associated with timberland assets…. This is the second in a three-part series related to managing financial risk associated with timberland investments, wood procurement and forest management activities. Part I of Managing Financial Risk in Forestry (Real Options and a Practical Question) introduced industrial views and academic efforts related to the use of financial derivatives to manage risk in the forest products industry and timberland investing sector. Gaston, in the 1958 movie “Gigi”, captures the general forest industry sentiment when he said “if you like that sort of thing.” Regardless, derivative securities improve the liquidity of risk (if you like that sort of thing). Let’s name our parts. Derivative securities “derive” their value from the prices of other underlying assets, such as stocks, bonds, currencies or commodities (i.e. wheat, gold or lumber). The most common of these financial instruments are forwards, futures and options. In theory, these derivative securities manage exposure to risks associated with the underlying assets. They do this by locking in prices and volumes in advance, thereby reducing uncertainty. For example, a lumber manufacturer can lock in prices for future lumber sales by buying lumber futures contracts traded on the Chicago Mercantile Exchange (www.cme.com). If lumber prices go up, the gain in the lumber sales price is offset by the loss from the lumber futures contract. If lumber prices fall, the loss in the lumber sales price is offset by the gain from the lumber futures contract. When used correctly, futures and options act as a form of insurance against unexpected price movements. This phenomenon, where risk associated with one asset is offset with a position in financial derivatives, is called hedging. Alternately, “speculators” trade futures and options simply to profit from price level changes. Does hedging add value to overall forestry investments? Answers to this vary. For example, the diversification of timberland investment portfolios is an operational hedge that produces clear, unequivocal benefits to investors. Alternately, the use of derivative contracts for day-to-day forest management activities works better on paper than in practice because of issues associated with the relatively small scale of individual forestry activities and the relatively large scale of standardized financial contracts. 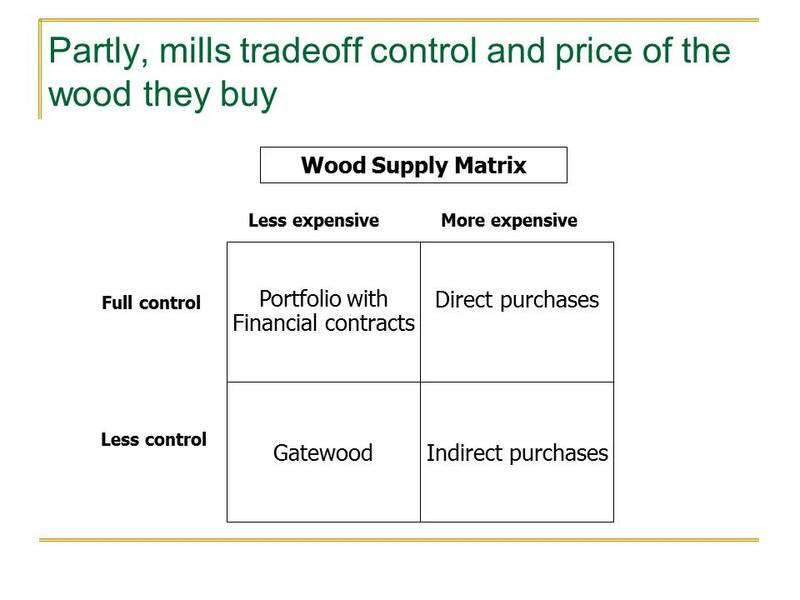 Part III discusses the pricing of options and use of supply agreements to manage timber prices. Since 2003, Dr. Brooks Mendell has delivered keynotes and workshops throughout North and South America, in English and in Spanish, related to risk management in forestry and timberland investment markets. To schedule Dr. Mendell for your event, please contact Heather Clark at 770.725.8447 or hclark@forisk.com.